Saunders » Roger Perron Inc. I would heartily recommend Roger Perron, Inc. to anyone interested in refurbishing his or her home. Roger has done two projects for us: a bathroom and a small addition to the house, both of which were executed impeccably and with an impressive and singular professionalism. Roger and the people who work for him are always intent on doing the job right. They are people who clearly take pride in what they do. His workers are always courteous, thorough and talented and able to react to unexpected situations as well as any requests the customer may have as the job progresses. They have a "can do" attitude in all things, which makes the experience of improving your home exciting and positive. Roger always does his best to see that all contingencies are taken into account before the job starts so there aren’t any surprises. His long experience in the field allows him to foresee potential problems and to calculate the cost of any job with astonishing precision. Both times we’ve worked with him he’s been able to arrive at designs that were far superior to anyone else we got bids from and the jobs always came in on budget. Roger has a creativity and a flexibility in his approach to the overall project which makes him unique and a cut above his competition. He was very helpful to us in the remodeling of our bathroom, guiding us through the process, helping us with some of the bigger decisions and working to help us find just what we needed to make the bathroom turn out the way we wanted – all the while staying within our monetary parameters. Any time we had questions or didn’t know what we wanted to do, he always had an opinion that was of great help. The work he did on the addition to the house was done beautifully and with surprising alacrity. We were ready to use it much sooner than expected and everything went off without a hitch. 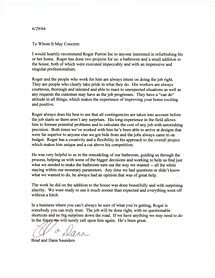 In a business where you can’t always be sure of what you’re getting, Roger is somebody you can truly trust. The job will be done right, with no questionable shortcuts and no big surprises down the road. If we have anything we may need to do in the future we will surely call upon him again. He’s been great.